The clickety clack of train travel may tend to put some travelers in a hypnotic state, a state probably better suited for meditation than wondering about how this giant rail project was ever built in the first place. Hell on Wheels is just that story, a rollicking if sometimes fairly disturbing account mixing fictional and real historical characters into a stew that will probably remind more than a few of Deadwood, in both style and substance. In the wake of the Civil War, former Confederate soldier Cullen Bohannon (Anson Mount) is on a hunt for the Union soldiers who massacred his wife and son in the closing days of the conflict. That gets the series off to a literal bang in a sequence taking place in a church confessional, instantly communicating to the audience that not much is going to be held sacred here. Bohannon is a desperate, half dead soul himself, motivated only by revenge and with very little left in his life. His hunt for the few remaining soldiers he's on the hunt for takes him west to where the Union Pacific was just beginning its westward trek to forge a new link across the still largely unsettled American landscape. Bohannon's obvious ruthlessness recommends him to the foreman of the largely freed slave crew pounding the rails into the land, and Bohannon is almost instantly made the so-called Walking Boss of the crew. That brings him into immediate conflict with an angry former slave named Elam (Common), and in fact the shifting relationship between Bohannon and Elam, which swings from outright hatred to grudging admiration to several shades in between, is a major element of Hell on Wheels' first season. Also in the mix is real life character Thomas Durant (Colm Meaney), a Union Pacific executive whose shady business tactics may have helped build the Transcontinental Railroad, but also helped contributed to a stock market fiasco as well as several other unseemly events. 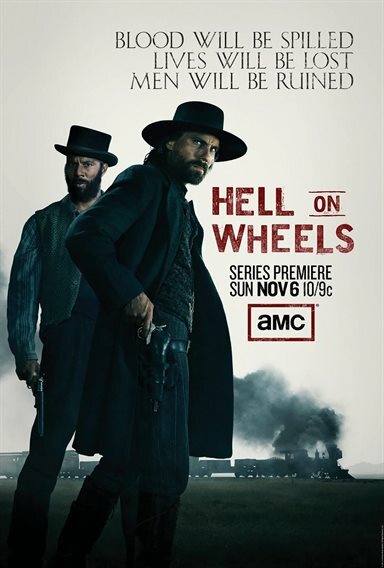 The rest of the cast of Hell on Wheels is rather large and unruly, and includes Lily (Dominique McElligott), the widow of a surveyor who finds herself torn between Durant and Bohannon; Sean (Ben Esler) and Mickey (Phil Burke) McGinness, two Irish immigrant siblings who are out to make their fortune in the west; Eva (Robin McLeavy), a "working girl" who forges an unlikely (and due to the times scandalous) affair with Elam; and Joseph Black Moon (Eddie Spears), a westernized Cheyenne who finds himself waffling between furthering his Christianization or returning to his Native American ways. Probably the most memorable character in the first season doesn't show up for an episode or two, but then becomes unforgettable. That is The Swede (Christopher Heyerdahl), a vicious (and really weird looking) Norwegian who becomes Durant's head of security and repeatedly clashes with Bohannon. Hell on Wheels is one of those supposedly "new" westerns that exults in a darker ambiance, with a slew of tormented characters interacting in a desperate and wild landscape. It's to the series credit, however, that this first season works remarkably well almost all of the time. Bohannon is a fascinating character, one who is trying to open himself up to something beyond rote vengeance, but who repeatedly falls back into killing mode when presented with the opportunity. Mount is an appealing presence, able to convey both Bohannon's viciousness as well as his innate sense of morality, despite his less than moral behavior. Meaney has a field day with the duplicitous Durant, crafting a kind of smarmy but also charming character that perfectly captures both the glitter and decay of a newly gilded age rising from the ashes of a horrible calamity. The rest of the large cast is also excellent, and the writing allows almost all of these disparate characters their own moment in the sun. With such a successful first season it isn't surprising to see the Blu-ray of said season to come packed with such an array of special features. Before getting to those, though, let's discuss the image and sound quality. To say they are excellent is an understatement. Taking place in such a beautiful and picturesque landscape, the video quality only enhances the experience. The same can be said for the audio, listening to that steam engine churn away over those rails, you feel as though you're on the train right then and there. Recreating the Past: The Making of Hell on Wheels features quite a few behind the scenes crew, like Director – Executive Producer David Von Ancken and Production Designer John Blackie, talking about what they wanted to achieve with this series. There's some great footage of the sets being built as well as some of the location shooting, some of which looks pretty muddy. It's nice to have the actual crew interviewed at length here rather than the traditional puff piece that focuses solely on the cast congratulating each other for giving such great performances. Crashing a Train: From Concept to Camera shows the planning and execution of one of the first season's big set pieces. Making of Featurettes offers seven short pieces, including "About Hell on Wheels", "The Guns", "The Wardrobe", "The Meaning of the Railroad", "Building the Train", "Locations and Sets", and "Dirty Medicine". Character Featurettes includes portraits of Cullen Bohannon, Elam Ferguson, Thomas Durant, Lily Bell, The McGinnes Brothers, Pawnee Killer and Joseph Black Moon. Episode Featurettes gives some background on the following episodes: Pilot; Immoral Mathematics; A New Birth of Freedom; Jamais Je ne T'Oublierai; Bread and Circuses; Pride, Pomp and Circumstance; Revelations; Derailed; Timshel; and God of Chaos. Hell on Wheels has already been renewed for a second season, and that season is probably going to tell the tale of whether Bohannon will be a riveting enough character to provide focal interest once the revenge scenario is played out. The indication thus far is that he will be, and the good news is there is a veritable glut of other characters here, all of whom will allow the writers to open up the series and explore other story lines. This is a very impressive series, with writing in the first season that is sharp and well crafted, the performances are fantastic, even from rapper-turned-actor Common. All these things combined make Hell on Wheels a must own for fans of long form story telling. Download Hell On Wheels - The Complete First Season from the iTunes Store in Digial HD. For more information about Hell on Wheels visit the FlickDirect Movie Database.